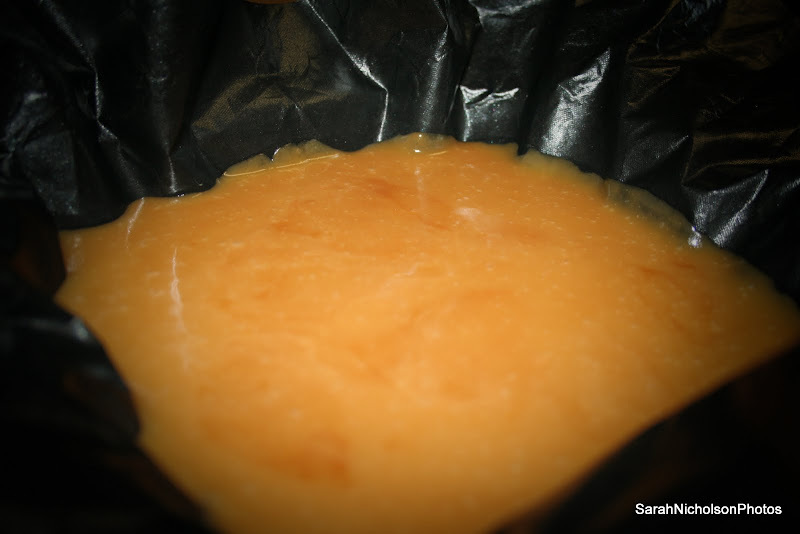 Proper English Toffee Recipe from my tastykitchen account! This is just yummy in every way. Butter, sugar, cream and vanilla. Where can you go wrong! Eh, yeah—try not eating spoonfuls of this while it’s cooling by the way. Mmm yumminess. Hi there. Just to note, we’re going to have a love-hate relationship after this. You’ll love me when you make this for others and they praise you like there’s no tomorrow. You’ll hate me when you realise how good it is and how addictive it is. Don’t say I didn’t warn you. Line a pan that you would like the toffee to cool in. I use a 7″ square pan and a cookie sheet—works perfectly. 1. Throw all your ingredients into a nice heavy-bottomed pan. 2. Put on a medium heat and whisk the whole lot around till it’s all combined and looks all beautifully buttercup yellow. Give it another bit of a whisk for good measure. 3. 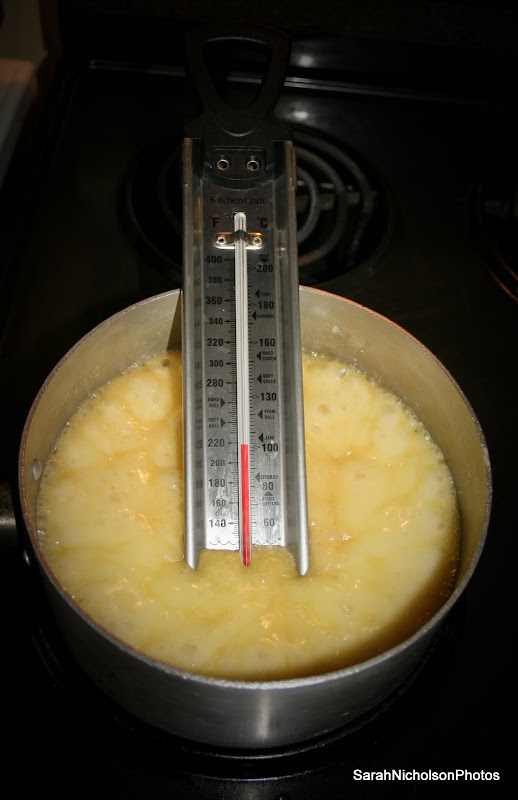 Pop in your sugar thermometer, turn the heat down to low and leave it alone. But keep an eye on it. Think of it as your teenage daughter (a recipe and a parenting lesson, this is value for money, I tell you). The difference between yummy toffee and burnt icky toffee is but a few measly seconds. 4. 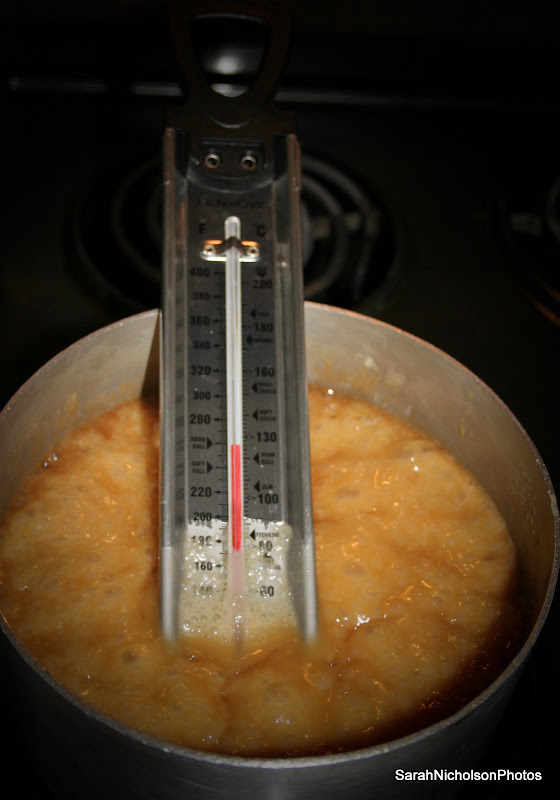 When that sugar thermometer hits 270, take off the toffee. Pour it into your perfectly prepared pan. 5. Look at your saucepan, sigh in resignation at the scrubbing you’ll have to do and put it aside to cool down. Now the hardest part is to walk away from this toffee. But you must. Because 270 degrees is hot. It’s reallyquite hot. You do not want a 270-degree burn. I know. I’ve been there. Ahem. So leave your toffee to cool down. 6. When your delicious amber-coloured toffee goodness has cooled and hardened somewhat, you may either crack or cut it into chunks. You may then proceed with the jaw glueing process of eating it. And yes, you can thank me now. P.S. You’re going to need that dentist on speed dial now.